The fear-mongering senator from South Carolina is expected to announce his bid for the GOP nomination in June. Now the flock is about to get a candidate to out-hawk all the others: South Carolina Senator Lindsey Graham, who is expected to announce his bid for the White House on June 1. “I’m running because I think the world is falling apart; I’ve been more right than wrong on foreign policy,” he said Monday on CBS This Morning. 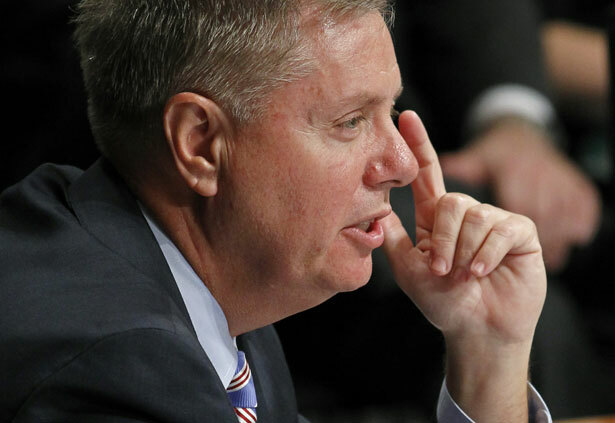 Graham’s foreign policy is essentially a philosophy that force can solve most problems. He pushed aggressively for the invasion of Iraq, for putting boots on the ground in Libya, and for military intervention in Syria. Graham isn’t unique for trying to peddle violence—it’s the fear he uses to market military action that makes him stand out. From his claims that Saddam Hussein was “flat-out lying” about weapons of mass destruction in Iraq and that “chemical weapons in Syria today means nuclear weapons in the US tomorrow,” to his assertion that ISIS “will open the gates of hell to spill out on the world,” Graham’s track record is a long, terrifying trail of hyperbole. 1. His support for the Fifth Amendment’s right to due process is selective: “If I’m President of the United States and you’re thinkin’ about joining al-Qaeda or ISIL—anybody thinkin’ about that?—I’m not going to call a judge, I’m going to call a drone, and we will kill you,” he said at the Iowa Republican Party’s annual Lincoln Day Dinner fundraiser on Saturday. 2. His support for the First Amendment is selective, too. “Free speech is a great idea, but we’re in a war,” he said in 2011, regarding the burning of the Quran by Tennessee pastor Terry Jones. 7. He claimed the world was “literally about to blow up” if the United States didn’t intervene in Syria. 10. He has said he is “glad” the NSA has the domestic surveillance programs revealed by Edward Snowden. Graham’s chances of securing the GOP nomination are basically nil. Still, his entrance to the race is yet one more signal that the right is not seriously considering an alternative to a neoconservative worldview any longer, and is instead betting that the easiest way to win is by scaring the pants off the American people.